Nani is probably, one of the most talented actors in Tollywood. He has two back to back films lined up for for release. First in line is the Yash Raj biggie Aha Kalyanam. 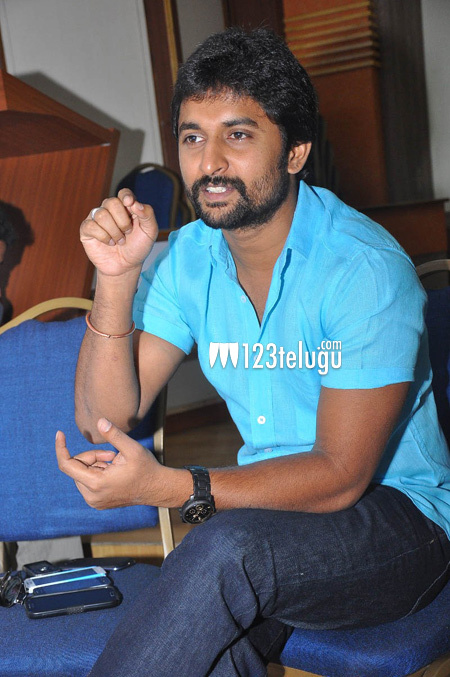 Nani is quite busy promoting this flick, and today he met the press and spoke about the film in detail. Let’s see what he has to say. Q) How did you bag this Yash Raj biggie ? A) It felt so delighted when Yash Raj Films approached me for Aha Kalyanam. Our meeting was arranged in Hyderabad and I went there with a lot of excitement. When the Yash Raj guys told me that its a remake, I was hugely disappointed. I made up my mind to reject the film, and asked them for one days time. They gave me the CD of Band Baaja Baraat and asked me to watch it and then let them know my decision. After watching the film that night, I was so impressed that I could not say no to the offer. Q) How was your working experience with the Yash Raj camp ? A) Oh ! It was awesome. For the first time in my career, I have worked with such organized people. Everything went on according to the plan and there was absolutely no delay, even for one day. Q) What changes have you made for the remake ? A) The story idea is the same, but a few cultural changes have been made to suit the nativity. Q) How do you think the audience will react to this remake ? A) There are bound to compare my film with the original. But I feel that the sweet and entertaining narrative will immensely connect with the audience. Q) Why did you make this film in Tamil, when you could have done it as a bilingual ? A) Initially there was a plan to make this film as a bilingual, but since I did not have dates, and as the Tamil script was ready we decided to go ahead with Tamil. I have dubbed for my own voice for the first time in Tamil. Q) There is hardly any gap for your films. How are you feeling ? A) I am not worried at all, as I play three completely different characters in all of them. Each film has a different theme and people would react to my performance in a different level altogether. Q) What role does Simran play in the film ? A) She has just a very small role in the film. You can say it is just a special appearance, but has adds a lot of weight to the script. Q) In an recent interview, Trisha said that she would love to work with you. Are you flattered ? A) I take it as a huge compliment and even I would love to do a film with her. Q) Do you have any dream roles ? A) I would love to do a film like Gladiator, but films like these are very rare in Telugu. I think only a director like Rajamouli can dare to make a film like this. Q) What are your upcoming films ? A) There are some films which are in the scripting stages. Once I am done with Jenda Pai Kapiraju and Aha Kalyanam, I would decide on what to do next.